There is one problem with it though…. the calendar doesn’t start until July. July? I can’t wait that long to use this lovely piece of kit – and I’m sure some most of you can’t either so that’s why I’ve designed my April, May and June Happy Planner Inserts. Perfect if you’ve bought a July 2016 – December 2017 Happy Planner, you can add April, May and June to the front of your planner so you can get all creative and organised! “This Month” page: What’s you’re reading, doing, important dates etc. To print the calendar section print five of the left-hand pages then turn your paper over and print four right-hand pages and on of the “This Month” page then you’re all set for the month – after you’ve added your divider of course! For your divider I’d highly recommend looking at this Photo Card Stock Paper*, it gives you a great quality finish but is robust enough to act as a separator for your monthly sections. 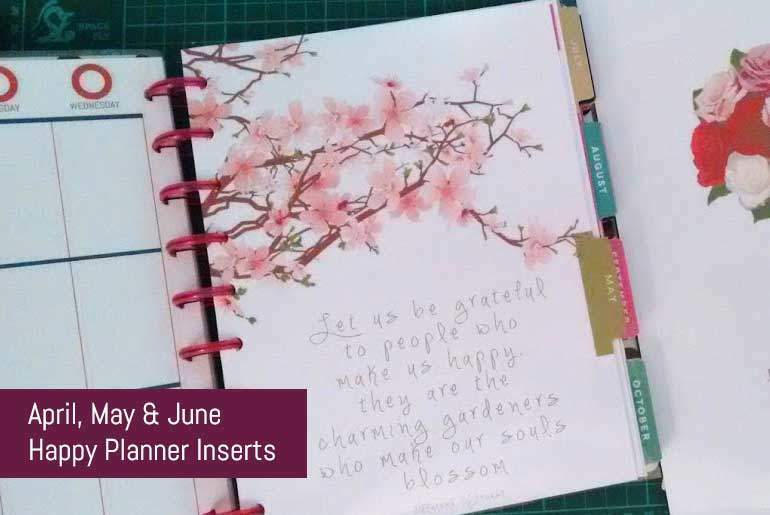 To get your free April, May and June additional Happy Planner Dividers and Calendar simply subscribe to my newsletter. You’ll then be emailed a password so you can access exclusive subscriber content, plus you’ll get an email once a week detailing the great content from the blog and an exclusive post too! What are you waiting for? Get your exclusive content now! Hello I subscribed because like you I bought a happy planner and I’m dying to use it now and not in August. I found you site and seen you were offering the free inserts for April, May and June so I subscribed to your newsletter to get them but the only one that worked was April it won’t let me download May or June. Is this fixable because I would really love to use them in my new happy planner. Any help or info would be greatly appreciated. Thanks so much. Sorry you were having issues with the downloads, it looks like the files didn’t upload correctly. I’ve re-uploaded them and they seem to be fine now so you should be able to download them from the site. I’ll email you this information as well in case you didn’t subscribe to comment replies. Happy Planning and sorry for the problem! I’m sorry you’re having problems. I’ve checked the files and they seem okay for me. Please send me an email to blog@flippingheck.com and I’ll send you a link to download another version to see if that helps. I subscribed and immediately downloaded the June Inserts, but when i opened the file, it says that something is keeping the PDF from opening. Please fix? I need this ASAP. Thank you!! Please make sure you open the zip file and then navigate to the “Purple_Pink” folder. You should then be able to access the PDFs (there are 4 separate files contained in the “Purple_pink” folder in the Zip Archive). Keep an eye out Folaurasha, I’ll add these soon now I know you want them – make sure yoú’re still subscribed to my newsletter to find out when they’re up! I’m having problems too. I can download any other files from the blog, but the months in this post. I tried them all, but I only need June. Can you help me, please? I’ve tried on several browsers and the file downloads fine. I did notice in Internet Explorer I had to try twice though. If you’re still having problems please set up a support ticket at http://helpdesk.flippingheck.com/ I will then be able to send you the files directly. Sorry for your problems, this has now been fixed. I don’t have anything specifically dated for 2017 but I have come up with some new designs. You can view these in my “Happy Planner” Category in the downloads section.